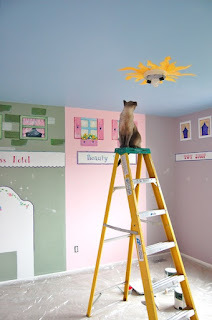 I am taking a quick break from my dollhouses to paint another one of my children's bedrooms. My kids are growing up and want more grown up designs. Nova was curiously asking what color was in the paint can. He got excited when I said a kind of grey. I hardly had the heart to tell Nova that cat fur in the paint tray is not really the look I was going for. Nova is fearless. He climbs ladders with way more confidence than I do!!!!! My kids are changing rooms and this mural does not suit the one who is moving in at all! It is fun to paint the walls and this one has been up for a while, so I am ready for it to go. I am not really a fan of grey, but I let my kids choose whatever they want (except black!). It's a pity to paint over those beautiful walls, but kids grow up and sure the room also looks nice in grey. Hi Lily, thanks! Nova IS adorable. He is such a character. He is the personification of personality!!! !